I’m quite speechless at the ending to be honest. I have mixed feelings about the ending. Part of me says that it was amazing ending to the series, and part of me says that the ending could have gone another route. 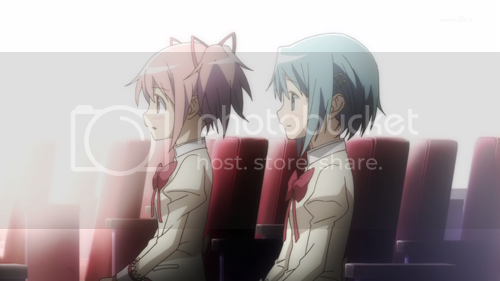 But hey, Puella Magi Madoka Magica turned out to be one of the best anime series in recent memory. Maybe it’s just me, but I’m surprised how Walpurgisnacht wasn’t that big of a deal, and its focus was more or less overshadowed by the fact that Madoka had become a Puella Magi. Still, the fight was pretty entertaining and nice to look at. 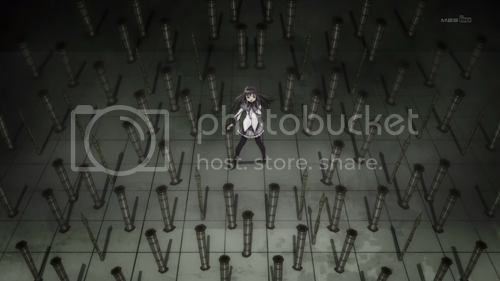 We see Homura pull out her own Unlimited Bazooka Works with a combination of her time magic to fight against Walpurgisnacht. 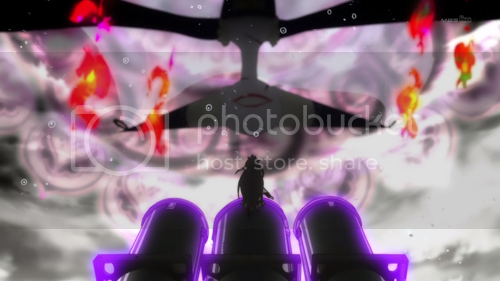 We also see Homura use some sort of power we haven’t seen before, which is manipulating vehicles/objects and aiming them at the enemy. Not quite sure how that’s works out exactly. Still Walpurgisnacht is too strong for Homerun-chan to take down. 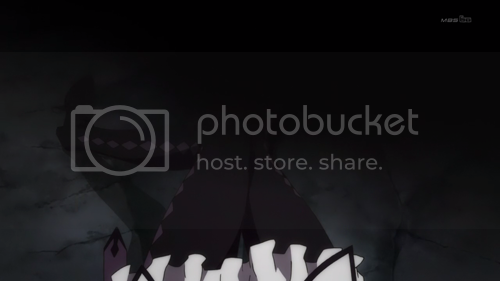 I also noticed what seemed to look like censoring on her leg? Did she mess it up? Seriously, I’m glad that they decided to release both episode back to back, because if I had to wait another week to see the last one, I’d be crying all week. The cliffhanger on this was just so intense, seeing Homura fall into despair for not being able to save Madoka from her fate and almost turning into a witch. As if there hasn't been any MadokaxHomura fanart already. That is until Madoka saves her from doing so, and decides to make a contract with Kyubey to become a magical girl. Now, what was Madoka’s wish? 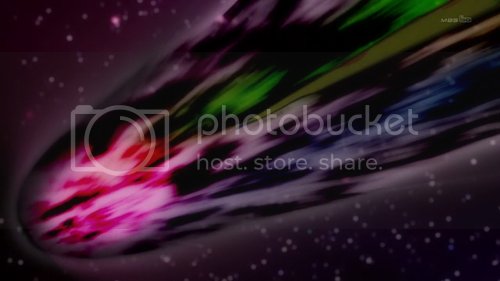 And with that wish, the game of Puella Magi and Witches is hacked. The system has been beaten. But here’s the thing. 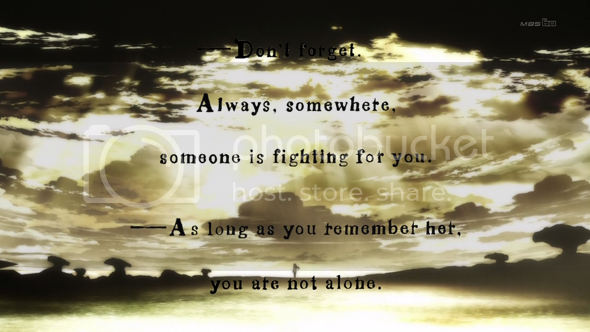 For me, I believe Madoka’s wording of her wish is what led the end to be what was. It’s a noble one, yes, but it could have been avoided. 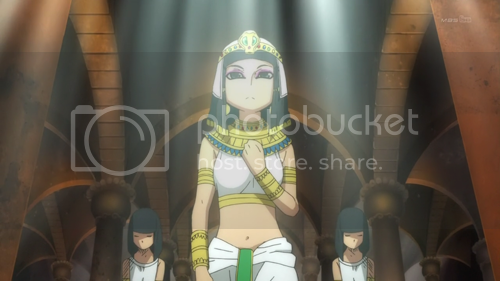 Madoka not only becomes a Puella Magi, but she becomes a Goddess. 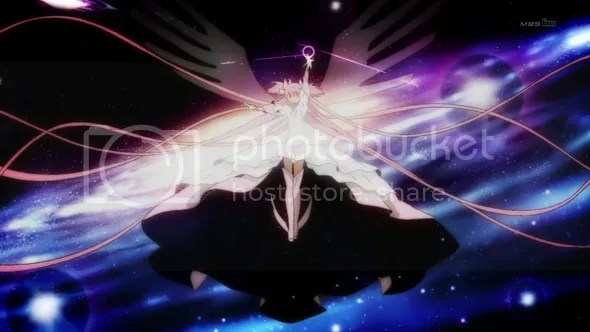 She is seen saving all the Puella Magi in the world from becoming witches, Present, Past and Future. 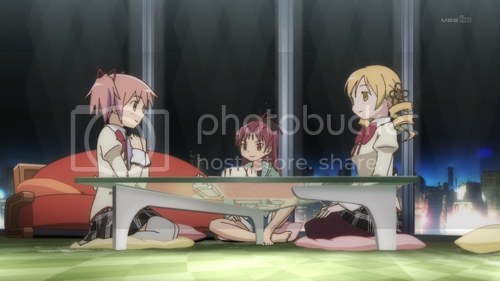 The world changes in accomodation to Madoka’s new laws of nature…or rather her new laws of the game. 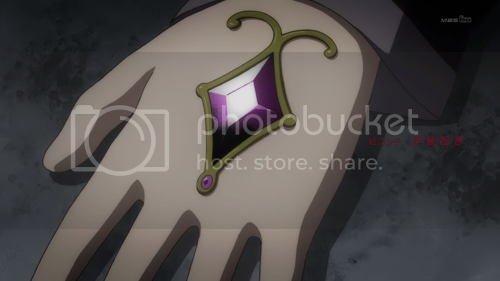 Her Soul Gem is the size of a freakin’ meteor which surrounds the planet in a witch-like aura. 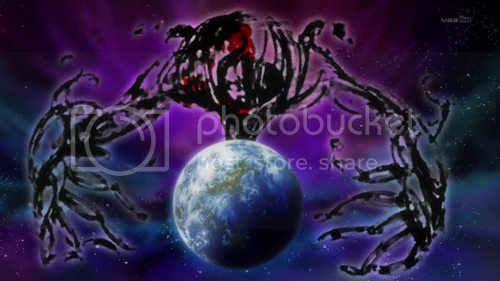 Madoka, in her new Goddess-like form, DESTROYS THE WORLD. Nah, not really. She actually does a world-reset. 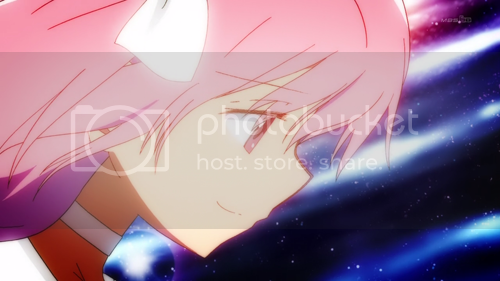 But in exchange, Madoka will have no memories of people, and people will have no memories of her. She’ll live on for eternity, battling witches til the end of time. 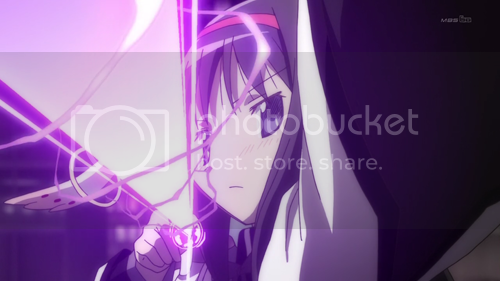 After a scene with Madoka and Homura that’s sure to spawn some yuri fanart, Madoka gives Homura her ribbon, as something to remember her by. Amongst the reunions with Mami, Kyoko and Sayaka during the episode, I felt a bit of warmth coming from those scenes, especially the scene with Kamijou playing the violin and seeing his dream come true, which tugged at the strings of my heart a bit. Probably because I’m a budding musician myself, and I can relate. We see a new world free of Witches, and we see Homura come across Madoka’s former younger brother Tatsuya, and her mom Junko and her father who’s name no one cares about. Junko doesn’t remember Madoka at all, and Tatsuya sees Madoka as a mere imaginary friend. A lot of people felt really sad about this, but I on the other hand had seen this demise before, (in Doctor Who no less) so I wasn’t that emotionally drawn in by the fact that no one remembers Madoka except for Homura (and possibily Kyubey). Interestingly enough, the world isn’t at peace yet, with Magical Beasts showing up instead of Witches and Homura’s new weapon is Madoka’s bow. It points to a side-story/sequel, but I don’t want one. 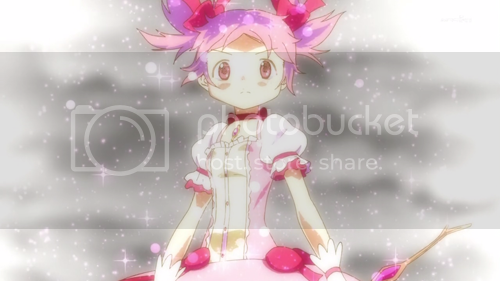 Madoka’s demise could have been easily avoided if she had left out the “With my own hands!” part of her wish. That way, the game would have been broken without her input. At least, that’s what I think. 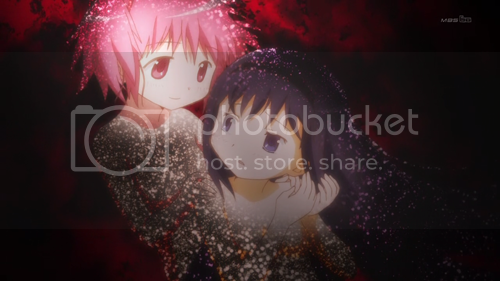 Either way, there is no doubt that Puella Magi Madoka Magica is a total GEM of 2011. 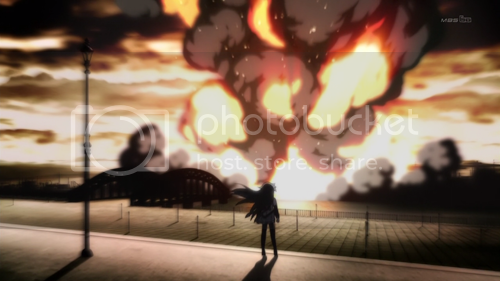 SHAFT made use of the delays to further make us fans more anticipated about the finale, even going as far as shelling out around 60 million yen of their budget to put an advertisment in a newspaper that circulates the entire of Japan to remind people to frickin’ watch the show. The show didn’t need a big cast of characters for everyone to have fun with. The story was where it was at, with a cliffhanger at more or less every episode, and basically being a show that re-defined the Mahou Shoujo genre. Yuki Kaijura never ceases to amaze with her compositions as the music in this show was amazing, and having her girl group Kalafina doing the ED of the show was simply glorious. I had some tears by the end of the show. No more Madoka Thursday. This show is a firm 9.5/10. Posted on April 29, 2011, in Anime, Puella Magi Madoka Magica and tagged Anime, Magical girl, Puella Magi Madoka Magica, Walpurgis Night. Bookmark the permalink. 7 Comments. 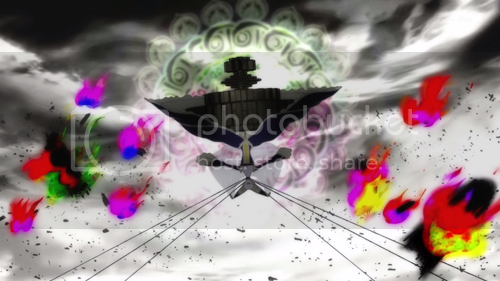 Favorite moments would be Homura’s final attacks with all those weapons! DAMN SO GOOD! When I finished the series, I was also unsure of what to feel, but overall this is a wonderful, it indeed redefined mahou shoujo genre. I actually thought Madoka’s “with my own hands” to be the defining part of the wish – she’s doing it all herself with no room for the Incubators to mess it up with say, something worse. But I kind of love the whole thing in the end. 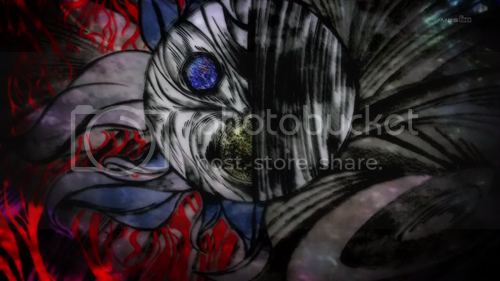 Episode 8 Kyubey: Oh hey, if you wanted to you could screw with reality and become a god. 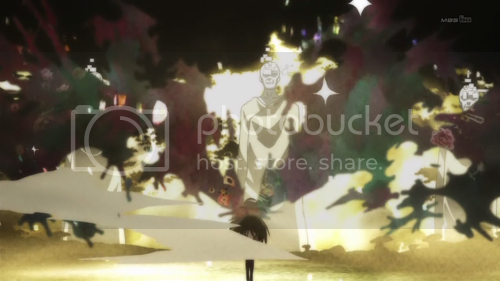 Episode 12 Madoka: Okay, I’ll screw with reality and become a god. Disappointed that it didn’t go the yuri route? Nothing against yuri, but if they made the whole Madoka-Homura friendship more on the yuri side, it would have taken away from the effort towards the main plot.